'In 1893 the World Columbian Exposition was held to celebrate the technological prowess of the time. (...). George Westinghouse, founder of Westinghouse and inventor of the modern compressed air train brake, wrote that trains were unlikely ever to go faster than 30 miles per hour. He saw this as no problem, however, because there was no need to go faster'. With hindsight, it is of course easy to find such ridiculous predictions, in particular when they were issued by a single individual that could perhaps have drunk a beer too much before talking to a journalist. More interesting are forecast that were issued after a targeted brainstorming and not that long ago. The book Global 2000, written in 1980 as a sort of IPCC-like report to the President Carter contains many of predictions and scenarios, many of which are now, after only 30 years, not very accurate. Demography seems to be one of the fields with larger inertia and more tractable concerning long-term predictions. Nevertheless, Global 200 considered that the World population in 2030 would be 10 billion; in 2100 , 30 billion. These figures can be compared to the IPCC SRES scenario A2, the most pessimistic , which assumes 15 billions in 2100. The UN median scenario is today 9 billions in 2050, declining thereafter. 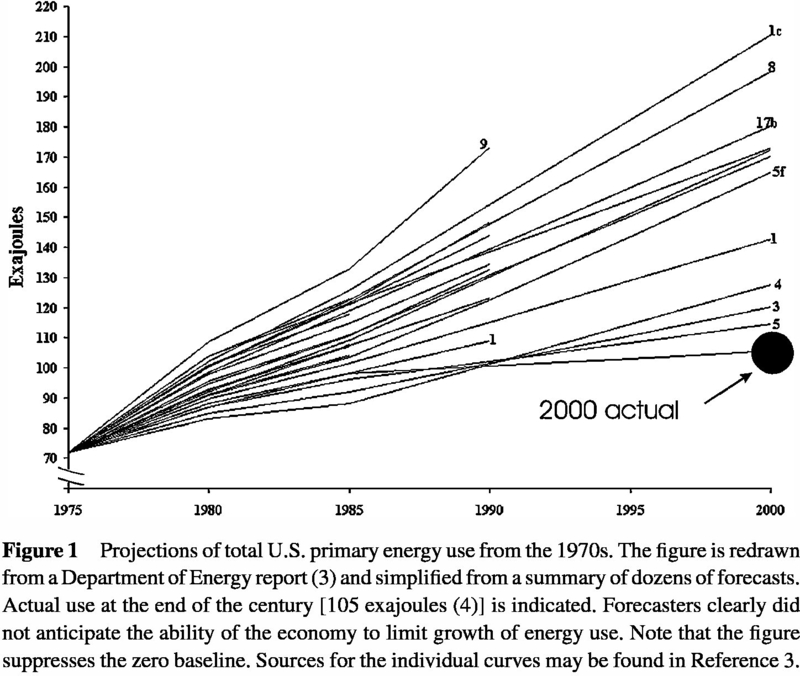 I stumbled by chance upon another set of predictions, this time for US energy consumption, all of the issued in the 70's with 2000 as time horizon. Some were more accurate than others, but there is clearly a bias. Those predicting the future, especially more than 20 years ahead, and without any disclaimer, are really not to be taken seriously. Most predictions are horrendously pessimistic. It's human nature. If a famous scientist predicted that in 2030 there will be 7.7 billion people, hunger will afflict less than 10% of the population and global temperatures will be 0.4°C colder than today's "unprecedented" high temps, nobody would bother the print it. Why? The media isn't interested in realistic scenarios. Hollywood-like catastrophe scenarios pull in the big audiences - and the big funding. The horror scenarios made today, like those in the past, are pure baloney, and will be shown to be so in 20 or 30 years from now. Let's not talk about the Ehrlichian and Club of Rome projections of the 70's. Eduardo's examples are plenty already. would you say, the prediction or projection of the society development is more complicated then for example make climate development predictions? For example: Stephen Schneider wrote and talked about global warming caused by increased CO2 concentration in the end of the 70s, but he also wrote about widespread nuclear power in the future and and the mentioned power consumptions. In physical models you have constraints: observations, physical laws, etc. You do not have free decisions in the climate behavior and totally unexpecting things like collapsing of the communism, unexpected environmental organizations stopping nuclear power etc. IMHO. @ghost: I'd say that accurate predicting of those pretty much interrelated (!) factors (climate as well as global socioeconomy) is hardly possible at all for the timescales we're talking about (20-100 years). At the very long time scale we are talking about, I would place less confidence on societal predictions than on climate predictions (assuming that for climate predictors the drivers, for instance CO2 concentration and solar irradiance were known in advance). But we have to consider that the experience on climate prediction is very limited, and in the cases when it can be validated it is not very successful. ENSO is the most important processes of climate variations at shorter timescales and models are not very skilfull at it. Only in the next few years will real climate predictions at decadal time scales be issued for the next IPCC Report, and then later in a few years we will be able to really have a feeling about how good models really are. If you click on my URL, you can see some of the predictions made back in 1970. No doubt, P Gosselin, this is an excellent compilation of wrong predictions. Unbelievable, I grew up with these predictions. And what about a similar list of all the wrong predictions that your beloved rational and enlightened scientists committed? It will be as long as this one. There is no way out of symbolic politics. But today, I can swim in the Lake of Constance (Bodensee) - 40 years ago, it was full of stinking dead fish. I remember well. How come it's clean today? We environmentalists are just as complicit as anyone else. It is a complete myth that it is Big Oil that is the main culprit (I'm no fan nonetheless), over 85% of world oil production is done by state owned oil companies, even right in Ecuador. Much of the damage shown in the movie is also done by Ecuador's state owned oil company, who use the same methods as texaco. The environmental and health consequences depicted in the movie are the result of oil use, period. We are all involved. Blaming corporations is too easy and obscures the larger issues. It is similar to people in the U.S. claiming that 'we' dont make anything anymore, while ignoring the fact that the U.S. is 4% of the world population but does 20% of the manufacturing. "The record of history is crystal clear"
Milton Friedman? Hey, you got that wrong: it's not Tea Party Day today, it's Earth Day! Yes and no. 'We' are all complicit? 'We' is almost identical with nobody. Why not fight Texaco? Why not try to get some better living conditions? Even money? Some dignity? We are so used here on klimazwiebel to bash environmentalists (with good reasons, sometimes) and their supporters (Al Gore, rock concerts, Sting!) that we completely forgot that for some people there is something at stake. There is no 'we'. It is only them who get cancer from oil pollution. They cannot win against their government, but they can try it against Texaco. Obviously, there is evidence that Texaco polluted their environment. Indigenous people there get help, among others from rock stars like Sting. I am not sure whether this is only ridiculous. It's about people. They try, and they earn our respect. Or am I wrong? Did I get brainwashed? thanks, yes. I agree. I think it is pretty hard to really evaluate projections, simulations without waiting ;). At least the GISS model from the 1980s can be evaluated a bit now. Actually, I am always skeptical when I hear short term climate prediction and very small scale regional predictions/projections. So, I am looking forward to the next IPCC report. Yes, I do. I know socioeconomic and climate models have to interact for predictions. But, for projection you could use different models of both sides. I assume. Well, my conclusion: while "alarmist" may be to pessimistic regarding the adaptation of the humans, society, and economy, deniers are cowards preaching doomsdays if we change anything. There is a middle way. Of course government is necessary and nothing would be possible without it. Your point is weak. It's not a question of yes or no. In my view the Laffer curve also applies to government. Not enough leads to a sub-optimum result. but so does too much. History is crystal clear on this too. Please note that the bits of innovation, i.e. the building blocks, for large infrastructure projects were not created by governments agencies. Rather they were developed by individuals like Edison, Shockley, Ford, Bell, Lemelson and the list goes on and on, in a free market environment. Government is there to provide civic order, modern infrstructure and to protect the people. Of course others may view this differently. There are even those who think government should be the ultimate super-nanny! Right! Who consumes Texaco's products? Is oil extracted by a state owned oil company less damaging? I have read some on this topic before, and the movie appears to do a poor job of presenting the situation, IMO. The government of Ecuador is using Texaco as a scapegoat as it's oil company is guilty of pretty much the same things. I'm not defending Texaco, they did terrible things, but if the negative effects of oil exploration is the subject, it is silly to concentrate on such a small segment. why are environmentalists not fighting the massive tar sands project being developed in venezuela? Why was there no mention in all of the literature I read about the movie of the damage done by Petroecuador? "...as a result of the publicity generated by the cases, Texaco agreed with the Ecuadorean government that it would clean up 161 pits, or its share of the total, at a cost of $40m. The work was done by 1998 and the government signed an agreement releasing Texaco from any further liability. Petroecuador was supposed to clean up the rest of the pits, but didn’t do so, partly because it continues to use some of them (including Shushufindi 61)." ...and texaco is the only villain? The movie purports to be "(p)resenting a complex situation from multiple viewpoints, the film subverts the conventions of advocacy filmmaking, exploring a complicated situation from all angles while bringing an important story of environmental peril and human suffering into focus." This is complete bs, the movie promotes litigating oil companies as the best way to help people negatively effected. What about the other 85%? To me, it all fits in too nicely with environmentalists preconceived biases. All of my friends and relatives (almost all very left wing) are shocked when I tell them that private oil companies account for less than 15% of global production. I have yet to meet an environmentalist who knows this. We filter what does not conform with our worldview unless we make a concerted effort not to, environmentalists are no exception. Werner, I did not wish to sound insensitive to the plight of people affected by oil. To me, oil itself is the problem, yet it is something that the modern economy is completely dependent on. Its extraction and refinement create huge problems that are not all borne by those who produce and consume it. I felt the movie appeared to miss this point and scapegoat evil corporations. I also was incorrect in my claim that private companies produce less than 15%, this was referring to reserves and I confused the two. I think private production is higher than this, yet this also points to the even greater role that national oil companies will play in the future. A brief look on wiki showed the top ten oil producers as all being of public ownership, though. I would sincerely like to see a post on this topic if others think that it is worth discussing. Should I suggest an article(or you)? Thanks for mentioning the people affected by oil production! It's easy for me to agree with most of what you say. Just tell it to those people portrayed in the film and who are fighting for their rights. Not as easy, I guess. Sure, send me an article, I'll be happy to post it. There are many reasons to start decarbonizing our energy production; oil for sure is one of them. thanks Werner, It may be a few days, I don't have anything in mind at the moment and would like to find something particularly relevant. Your posting on the bolivian climate conference and the issues surrounding the governments gas exploration gets at what I wish to discuss; the complex role energy production plays in developing countries. "Global records of surface temperature over the last 100 years show a rise in global temperatures (about 0.5° C overall), but the rise is marked by periods when the temperature has dropped as well. If the models cannot explain these marked variations from the trend, then we cannot be completely certain that we can believe in their predictions of changes to come." The thing to note isn't demand but production. 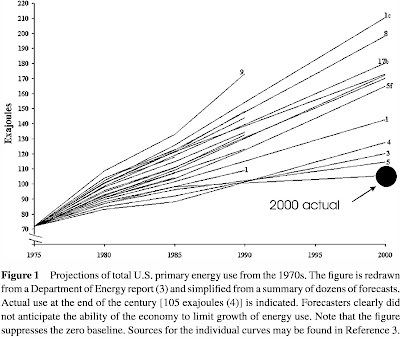 Hubbert got it right when he predicted that the U.S. would reach peak oil by 1971 and global peak in 2005. Now, the U.S. military predicts a global production drop between 2012 and 2015. As for oil demand, there's been a 3 pct drop for OECD due to the economic crisis, offset by increasing demand from China and India due to a rise in car and appliance sales.